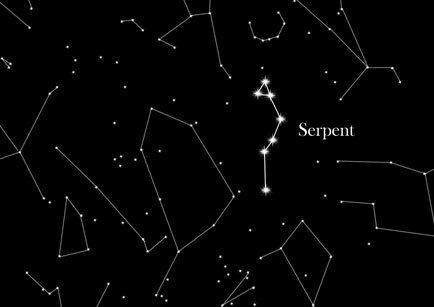 As the only constellation in the sky the serpent is made up by two non-contiguous parts. These two parts are made of long chains of stars. It is also highly interesting that only in 2010, a planetary system in this constellation was discovered only 170 light years away! The snake is also among the 48 already mentioned by Ptolemy. The coil consists of two parts, a triangular head and the more eastern part called the tail. The head of the Snake, Serpens Caput is in the west due to its triangular shape quite. The tail, Serpens Cauda, is located on the edge of our Milky Way. In this part of the snake you can find the very known gas nebula M16. There are two different forms of representation for the formation of the constellation Serpent: The city Lema was made insecure over and over again, haunted by a many-headed serpent. The hero Heracles was told to kill this beast. He noted that the snake got new heads as soon as he struck one off. In addition, he was constantly attacked by a giant cancer. He got help from his nephew, who burned the pieces where Heracles struck of the snakes heads, so they could no longer grow out.